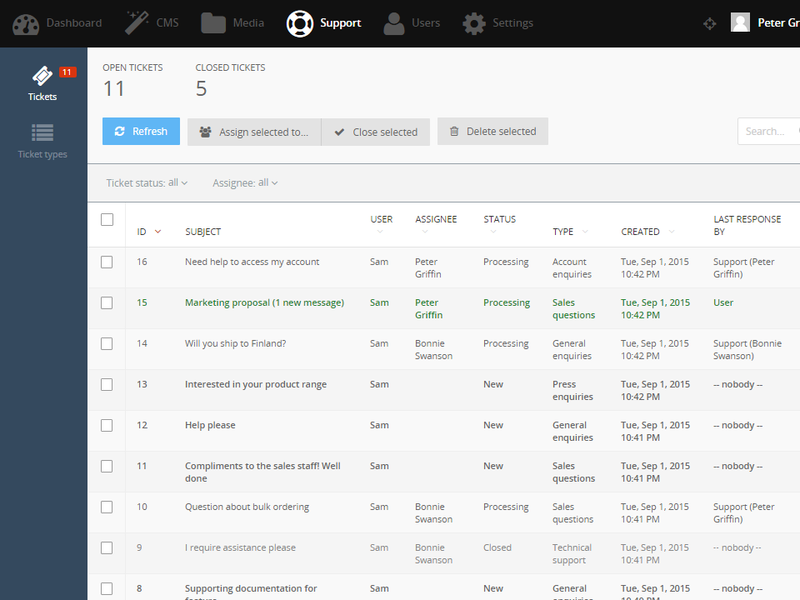 This plugin allows you to manage communication with front-end users using a basic ticketing system. Tickets are created by users and assigned to support staff. 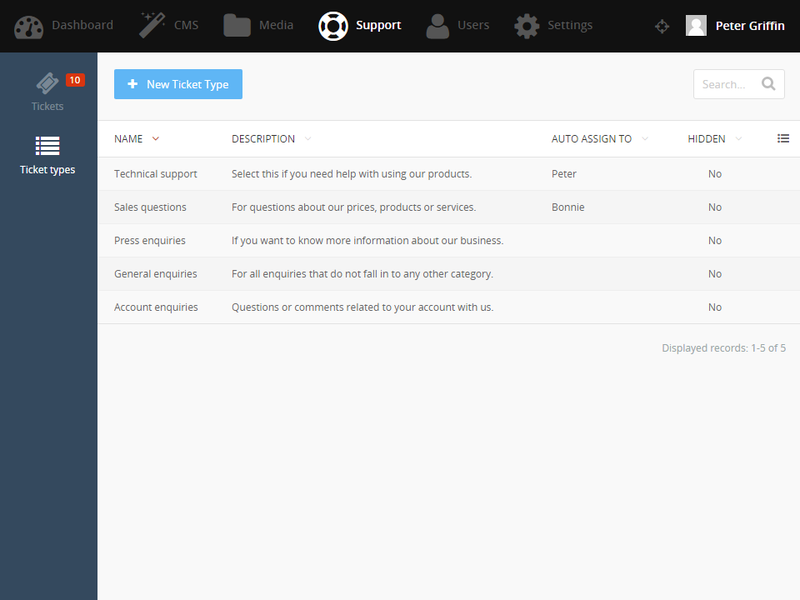 Support staff can respond via the back-end, make internal notes and reassign tickets to other support staff. 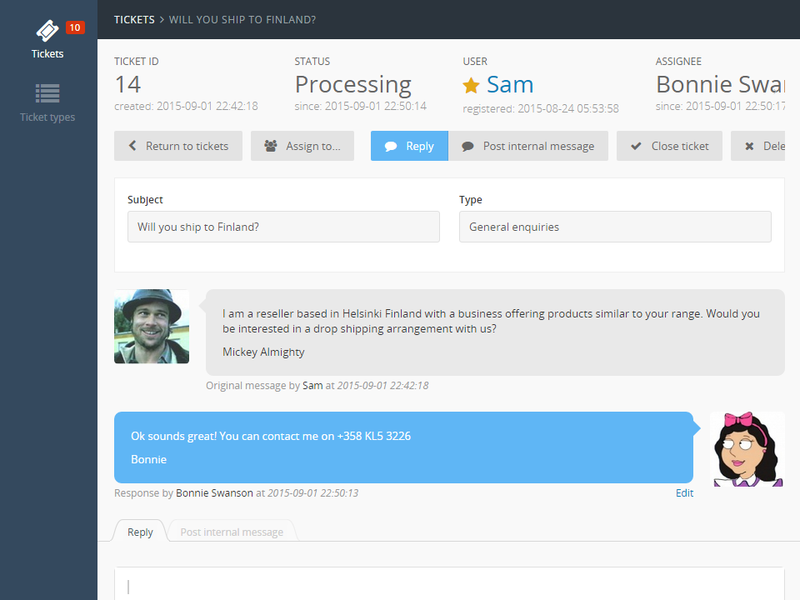 Users and staff can interact with eachother by making comments against the ticket and can also provide file attachments. This plugin requires RainLab.User to operate. Only registered users can submit tickets. All ticket activity will be sent to the user who logged the ticket, except for internal messages between staff. Likewise ticket activity will be sent to the assigned staff member or to all staff members if no assignee is used. When a ticket is closed, all participants will be notified. Notifications are not sent to the person who triggered the event. Select Settings > Administrators > Manage Groups > New Group in the backend area. Place a tick in Add new administrators to this group by default. to add all the existing admins to this new group (optional). This plugin relies on the system schedule process for running its automated tasks. You should ensure that your cron table is configured correctly for this plugin to work. Alternatively you can manually process the support logic by calling php artisan support:run and run it every 5-10 minutes. Last message sent was by a support member. Last message was not an internal message. Ticket is not closed already. | automatically, or set to false to disable this feature. 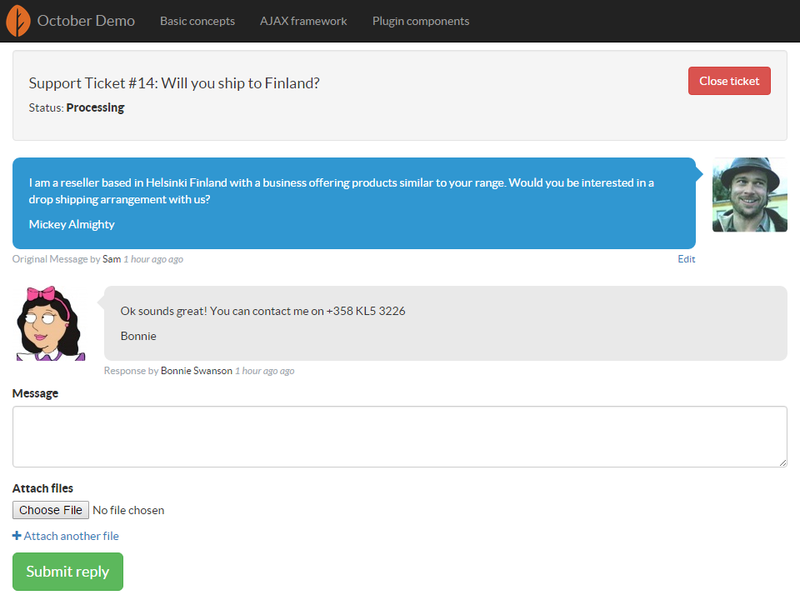 The plugin provides several components for building the support pages. redirect - a page name to redirect to after submitting a ticket. ticketTypes - a list of available ticket types loaded from the database. title = "Submit support ticket"
submitPage - a page name to link to for submitting a new ticket. ticketPage - a page name to link to for viewing a ticket. tickets - a list of support tickets loaded from the database. updatePage - a page name to link to for updating a user posted message. isPrimary - set this to true to use this page for generating links within mail notifications. Only one ticket page should be primary. ticket - the ticket object loaded from the database. If the ticket is not found, the variable value is null. ticketPage - a page name to link to for returning to the ticket view. model - the ticket or message object loaded from the database. If the object is not found, the variable value is null. updateMode - determines if this page is being used for updating ticket or message content. The value will either be message or ticket. Can you please either improve upon above mentioned suggestions or provide option to disable file upload? Note: I love your product though and wanted to provide constructive feedback!! Minor update to support command internals. Ticket submission component now supports forcing a ticket type. Added validation to ticket submission. Update main menu item to include SVG version. Minor UI and code improvements. Fixes protection level on Support model class. 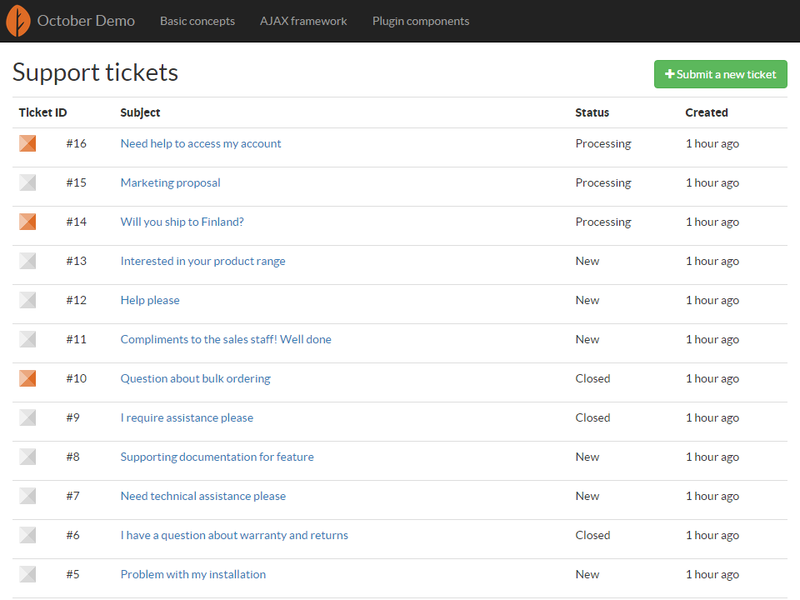 Add pagination to the ticket list component. Attachment links are now shown in staff notifications.